This morning, while I was jogging, I realized that I am at the halfway point in my practicum. It feels kind of tragic. Luckily, I have this awesome project to work on! The first thing I did after my 40-minute Conservation Lab fix was to go over my survey notes and come up with the series that will maintain order of the collection contents. I took my ideas to Brandon and we agreed on four, possibly five. 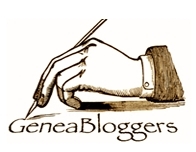 Hugh C. Brown, Correspondence, Photographs, the Young Family Association, and maybe Memorabilia. Next, I started processing the first series. The majority of one entire records center box is letters. 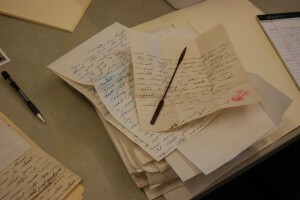 I separated those by family correspondence, military communications, and love letters. Here is a stack of Hugh’s letters from his one and only, Gwenie! Gwen sealed this top letter with a "real" kiss, as she called it. In this picture, you can see unprocessed letters to the left, my survey notes to the right, and what is that on the top of the stack? Katie’s coveted microspatula. Shh. Next, I asked Russ, the photo conservator to come down and look at one box in the collection that houses the oldest photographs. We discussed options for preservation and then he took the box up to his studio. I hope he doesn’t tell Katie that he recognized her microspatula. The more recent photos will be processed simply with clear sleeves or interleaving. Here are two shots of the author of those love letters. Gwen wrote faithfully to Hughie during his church mission, flight school, and his war service. 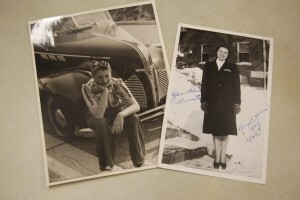 She signed these photos and sent them to Great Britain. One of the saddest things about processing this collection is reading the communications between the State Department, the British government, and the Brown family upon the loss of their pilot son. This particular letter garnered much attention, today. King George sends his sympathy to Hugh's parents. Signed, sealed, delivered! 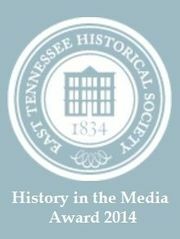 The other fun thing I got to do, today, was attend a program to honor outgoing Church Historian, Marlin Jensen, and to welcome the new historian, Steven E. Snow. Kind of an historic time to be working at the Church History Library. Great speakers, fun music, neat presentations. 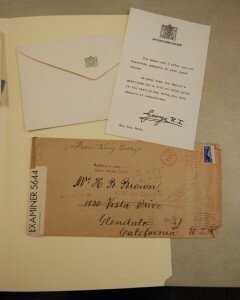 This entry was posted in Collections Processing, Conservation and tagged correspondence, Katie, series, survey. Bookmark the permalink.